Photo: Morrow County Courthouse, ca. 1903, 100 Court Street, Heppner, OR. Listed on the National Register of Historic Places in 1985. Photographed by User:Ian Poellet (own work), 2012, [cc-by-3.0 (creativecommons.org/licenses/by/3.0)], via Wikimedia Commons, accessed May, 2015. 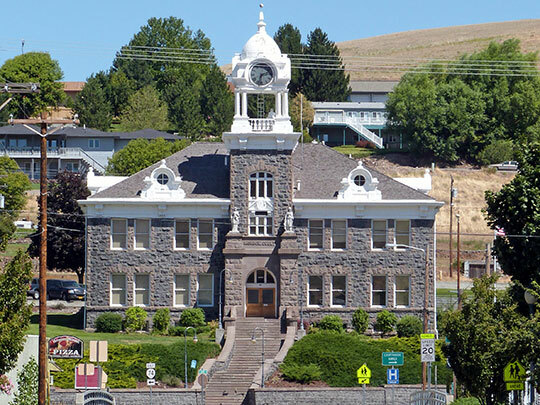 The Morrow County Courthouse is located at 100 South Court Street, Heppner, OR 97836; phone: 541-676-9061. Established in 1885, the county is named for Jackson Morrow, an original settler of Heppner who became a State legislator. Morrow's legislative position influenced the creation of the county.